Rehabilitate? Or, Eliminate? – Buzz Lightyear’s Space Ranger Spin! [Poll] | It's "All in WDW"
Greetings, my friends! Welcome back! Welcome back to our little corner of the Disney-verse! Did you have a happy holiday season? I certainly hope so! Let’s start All in WDW’s 2018 off with a New Year’s “bang”, shall we? Opened in 1998, the Magic Kingdom’s much-beloved Buzz Lightyear’s Space Ranger Spin will reach its 20th anniversary this year! Of course, these days, being that long in the tooth opens up any attraction to Disney’s scrutiny. That’s right, folks. If The Great Movie Ride at Hollywood Studios can be a “target” for replacement, so can Buzz. Buzz Lightyear’s Space Ranger Spin! Should we rehabilitate? Leave the theme alone, but give it a bit of a facelift, maybe? Should we eliminate? Replace it with a new attraction altogether? Or, should we simply leave it completely alone? ← The Garden? It’s Gonna Rock! Rehab to upgrade the firing systems and repair all of the malfunctions! This attraction has far too many non-functional vehicles and guns in it every time we go. It’s a lot of fun, as evidenced by the ever present long lines. It’s still a great ride, but I prefer the versions in California and Paris. It would be great to have blasters that detach from the ride vehicle, like those rides. That, a fresh coat of paint, and maybe some new effects, and it will be great for years to come! 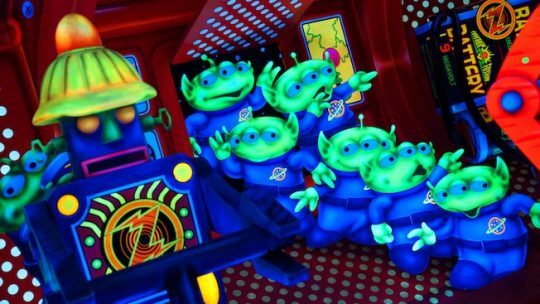 Upgrade the attraction to Buzz Lightyear Planet Rescue from Shanghai Disneyland. See ride video above. Update it with digital screens like Toy Story Midway Mania. Upgrade and move to Toy Story Land. My 3 ye old doesn’t understand why Buzz & Woody aren’t near each other.